I stumbled upon this last night and started tearing up. 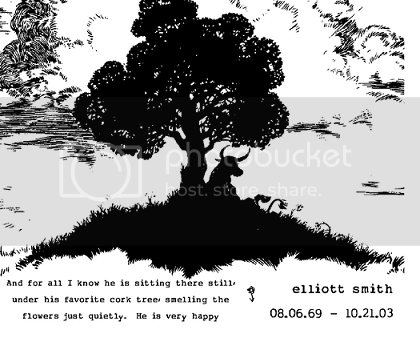 If you don’t know, Ferdinand the bull was one of Elliott’s tatoos and is a simple, beautiful story. I don’t think I’ll ever find another musician who affects me as strongly as Elliott did and still does, and if you’re reading this blog and somehow, someway haven’t heard the man…do yourself a favor and buy Either/Or right now before you do anything else. The DIY Rockstar is interviewing every indie label on the planet for the next three weeks. Check it out.